All you need to know about our new hydrogen car. The Mirai signals the start of a new age of vehicles. Using hydrogen - an important future energy source - to generate electricity, the Mirai achieves superior environmental performance with the convenience and driving pleasure expected of any car. The Mirai uses the Toyota Fuel Cell System (TFCS), which features both fuel cell technology and hybrid technology, and includes Toyota’s new proprietary FC Stack and high-pressure hydrogen tanks. The TFCS is more energy efficient than internal combustion engines and emits no CO2 or pollutants when driven. Drivers can also expect the same level of convenience as offered by gasoline engine vehicles, with a generous cruising range and a hydrogen refuelling time of about three minutes. The Mirai delivers everything expected from a next-generation car: an immediately recognisable design; driving exhilaration stemming from superior handling stability achieved by a low centre of gravity; and quiet but powerful acceleration provided by the electric motor. 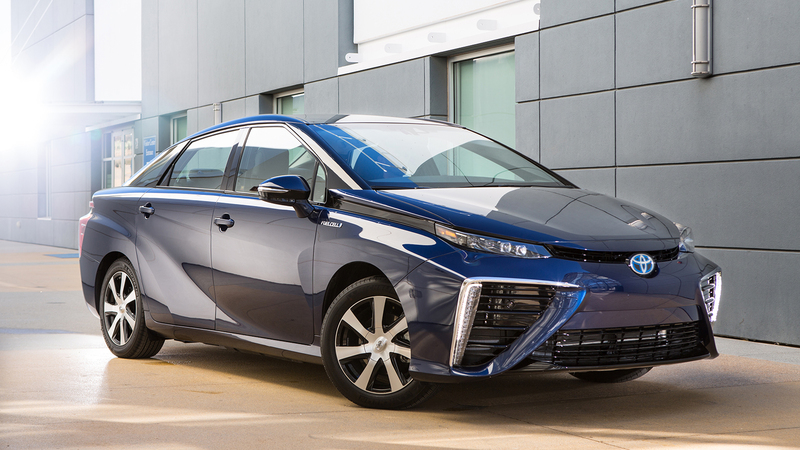 The Mirai features the TFCS, a fusion of fuel cell technology with hybrid technology. The system uses Toyota-developed components including the Toyota FC Stack, FC boost converter, and high-pressure hydrogen tanks. The new Toyota FC Stack achieves a maximum output of 114 kW (155 DIN hp) and a world-leading power output density of 3.1 kW/L (2.2 times higher than that of the previous Toyota FCHV-adv limited-lease model). Tanks with a three-layer structure made of carbon fibre-reinforced plastic and other materials are used to store hydrogen at a very high pressure of 70 MPa (70 megapascals, or approximately 700 bar). Compared to the high-pressure hydrogen tanks used in the Toyota FCHV-adv model, tank storage has been increased by approximately 20 percent. Handling stability and ride comfort are both improved through the location of major parts such as the Toyota FC Stack and high pressure hydrogen tanks centrally under the floor to achieve a low centre of gravity and superior front-and-rear weight distribution, as well as the use of a high-rigidity body, which features enhanced rigidity around the rear suspension. The brake support mode makes efficient use of regenerative braking and improves braking performance when the driver wishes to greatly reduce vehicle speed such as when negotiating long downhill sections of road.